Beginning on or about Saturday, October 31, Dulles Corridor Metrorail crews will relocate the Kiss & Ride lot located at the Herndon-Monroe Park & Ride facility on Sunrise Valley Drive. This will clear the area needed for the installation of the water and sewer utilities that will serve the future Herndon Metrorail Station now under construction in the median of the Dulles International Airport Access Highway (DIAAH). A temporary Kiss & Ride lot will be will be located in the surface lot directly across from the Park & Ride facility's garage entrance. Ten parking spaces have been reserved for Kiss & Ride Drop-Off. Vehicles entering the temporary Kiss & Ride Lot will turn right and follow a counter-clockwise pattern through the lot. To access the Temporary Kiss & Ride Lot from Sunrise Valley Drive take the first right into the surface parking lot and bear right. Follow the circulation pattern to the reserved parking spaces or continue around the lot to the Kiss & Ride Drop-Off curb. To access the Temporary Kiss & Ride Lot from the Eastbound Dulles Toll Road, take Exit #11 and stay to the right. Follow the directional signage to the Temporary Kiss & Ride Lot. To return to Dulles Toll Road eastbound from Temporary Park & Ride Lot, turn right out of the lot and turn left at the intersection. Follow the roadway around to the Dulles Toll Road Toll Booth. 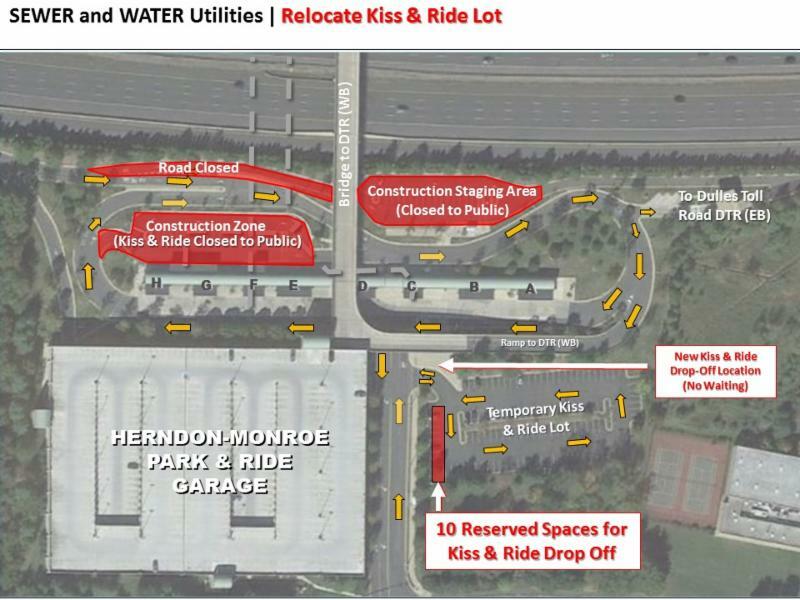 The current Kiss & Ride lot will be closed for construction and relocated to the surface lot directly across from the entrance to the Herndon-Monroe Park & Ride Garage. Cars entering the temporary Kiss & Ride Lot will turn right and drive counter-clockwise through the lot. To receive email notifications and other information regarding construction activities and progress on the Dulles Corridor Metrorail Project, please sign up on the project's website, www.dullesmetro.com, or call 703-572-0506. Also, a 24/7 emergency hotline is available for Dulles Corridor Metrorail Project construction-related issues: 844-385-7245. You can also call our customer service at 703-339-7200, TTY 771.